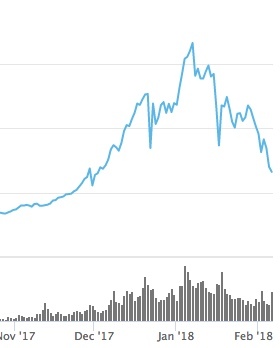 The total market cap of all crypto tokens peaked at roughly $825bn and is down roughly 50% since then. But most of you know all of this. The more interesting question is what, if anything, to do about it. In times like this, I like to turn to the fundamentals to figure out where things stand and how I should behave. So how do we do a fundamental analysis of crypto prices. Is $8000 high or low for BTC? Is $800 high or low for ETH? I see people opining on these things all of the time based on historical prices and that is not a proper way to value an asset. You need to have some fundamental theory of value and then apply it rigorously. There are plenty of people doing that kind of work in crypto-economic circles and I saw two blog posts in the last week that I thought were quite good. Here is a post explaining the NVT ratio (network value to transaction ratio). And here is a post critiquing the monetary velocity approach (MV=PQ) and proposing an alternative. What you can see from these two posts is that not everyone in crypto land is speculating without thinking. There is some serious economic thinking going on and it is going to be super important in the coming years. However, the bigger problem in crypto land is that none of the public blockchains have really shown they can scale to the volumes of transactions that would be required for blockchain technology to go mainstream. I have likened this situation to dialup modems in the 90s eventually giving way to broadband internet (and mobile broadband internet) in the 2000s. I am confident that trust-less consensus-based systems will be able to scale to the volumes we need to go mainstream but we are not there yet. The transaction ratios and monetary volumes that drive value in the economic models I linked to above just aren’t there yet to support the almost trillion dollars of value that crypto tokens reached in early January. But there are some very promising signs out there. We have the Lightning Network getting implemented in the real world. Lightning is Bitcoin’s great hope for scaling transaction volumes. Truebit is off-chain computation for Ethereum. Neither I nor USV has an economic interest in either Lightning or Truebit. I mention them because they are two of the more interesting efforts out there to scale these big public blockchains. There are many more of them. The truth is that if you look behind the scenes, you will find quite a number of strong technical teams that are working on scalability and some of the other fundamental challenges of public blockchains. The crypto sector is full of get rich quick schemes and janky token offerings, but it is also full of brilliant computer scientists and strong engineering teams working on solving these challenges. And I am quite confident that they will solve them. When and how is harder to predict. So given all of that, how does one do a fundamental analysis of crytpo tokens and the crypto sector? Get the Cryptoassets book and read it. The authors do a great job of outlining how one can and should do a fundamental analysis on crypto tokens. Follow the crypto-economists who are writing regularly about this stuff and read what they have to say. I linked to two of them above in this post. Understand the technical challenges and follow the progress being made in solving them. As more progress is made, that should be reflected in the prices of the top public blockchains. If it is not, that would be a buying opportunity. I don’t believe that the recent selloff is a massive buying opportunity, but I also don’t think that anything has really changed in the fundamental analysis of the sector in the past month. I remain long term bullish and short term cautious.